As we are very much selective about our diet, similar care should be taken while buying foods for our adorable pets. We need not to spend a lot for that, but carefully chosen and prepared food plays important role to keep our pets healthy and cheerful as we are what we eat holds true for our pets too. It is something of a cliche to say pets come to resemble their owners, but there is a lot of truth in it. If we are overweight there is a good chance our pets will be overweight as well. Obesity is as much a problem in pets as it is in humans and one of the remedies is exercise. Dogs have to have exercise to stay healthy and the exercise is just as good for their owners too. How much exercise your dog needs will depend on its breed, a Chihuahua will need a lot less than a border collie, but all breeds have to have exercise at least once a day to keep healthy muscles and bones. However be careful on very hot days, which can be dangerous for dogs. Cats need exercise as well, although not as much. Cats exercise in short periods of frantic activity. Get a favourite toy and play with your cat for up to 10 minutes a day. Dogs and cats need lots of clean water. Fill the water bowl every day and give your dog extra water after any strenuous activity. Cats do not need as much water as dogs, they are descended from desert dwellers and they get a lot of their water from their food. They cannot digest lactose so don't give them milk. They want fresh water in a clean bowl. Humans and dogs are omnivores; they can eat meat but also survive happily on a meat-free diet. Cats cannot. They have evolved to the point where they have to use protein as their source of calories. Humans use carbohydrates to get their calories. The correct types of protein cats need are only found in animal tissue. Feeding your cat a plant protein diet can be harmful and sometimes fatal. Dogs are more like us. They can eat a diet high in meat or low in meat. They are quite happy to eat non-meat ingredients in their diet. Dogs need good fats and protein, but not that many carbohydrates. A dog's diet should be about 10% protein and, unlike cats, some vegetables too. Cooked bones are dangerous to pets; they are brittle and splinter easily. They can get stuck in the throat, bowel or stomach and sometimes perforate the bowel. The best bones to give to pets are uncooked neck, brisket or wing. However even uncooked bones can fracture teeth. It is often said that pets do best on a diet of raw meat and bones. There is no evidence to support that idea. There is evidence that pets are at risk of infection by bacteria in the raw meat. 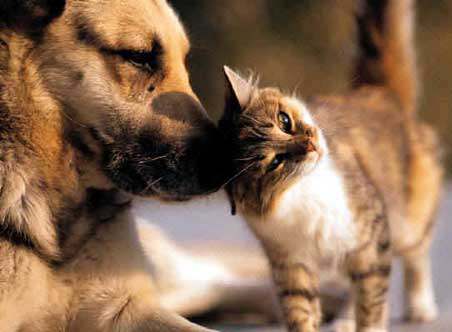 Hill's pet nutrition guidelines set a good standard for pets' food. Della is a complete animal lover with a fondness for Burmese cats and dachshunds. She writes on animal care and behaviour for a range of websites and blogs. She suggests that if you want to learn more about the correct nutrition plan for your pet Hills Pet is a good place to start. I agree with "never feed your dogs cooked bones" because I actually experience that and your dog is definitely in danger because of the sharp bones that may swallow.